Josephine-Kathryn Smith is better known by her nickname "Cinderella" for her unfortunate habit of losing shoes. She's a relaxed, funny, messy elementary school student who is just starting to feel the pressures of shifting alliances in her social circle. Cinderella welcomes a friendship with her new neighbor Erin, especially once her former best friend Rosemary T. starts to give her the cold shoulder. Cinderella and Rosemary T. are both competing for the starring role in the Pumpkin Blossom recital. The only problem is, will Cinderella be able to find her missing tap shoe in time for the show? If not, the role will default to Rosemary! In the meantime, Erin asks for Cinderella's help in an area she thinks Cinderella must be expert in: sussing out whether Erin's future stepsisters are wicked or not. Cinderella begrudgingly has to admit that she has no stepsisters of her own, but she still feels equal to the task. She comes up with a hilarious list of criteria on what might put a new stepsister firmly in the evil category. The girls create a checklist including items such as: has a lot of luggage, stares in mirrors, owns too many shoes. Worryingly, Erin seems to have far more of these characteristics than her stepsisters do! I did think it was a very strange family dynamic that the stepsisters were not introduced to each other until the day of their parents wedding. As one can expect from the story's light-hearted tone, all is satisfactorily resolved by the end of the book, however. I loved all of the exclamations and creative use of language that Cinderella uses throughout the story. Light rain is "dribbly-spit", when she's upset, she has a "problem with a capital P." She even improvises a tap shoe by sticking a flat tack into the toe of her sneaker. This humorous middle-grade story will be perfect for readers who are reading just above Junie B. Jones level. 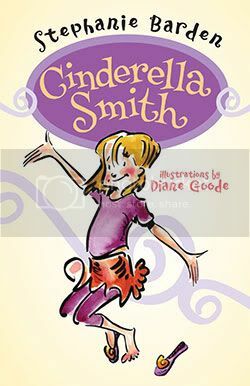 Charming, quirky and unique, Cinderella Smith is certain to be a favorite with tween readers. Debut novelist Stephanie Barden is coming out with a sequel in 2012.